The US Senate Armed Services Committee (SASC) spent most of Thursday (Washington time) grilling Pentagon officials on the faltering JSF program as it hurtles towards a probable Nunn-McCurdy cost breach in April, which will likely result in all expenditure being frozen while the program is substantially restructured. Of key interest to SASC members was the growing cost of the program, with Pentagon acquisition head Ashton Carter telling the committee that the cost per aircraft had grown by more than 50 per cent since 2002, and by 17 per cent since 2007, bringing the program right up against the Nunn-McCurdy trigger threshold. The Nunn-McCurdy process, named after the law’s two sponsoring legislators, would see Pentagon and program officials brought before Congress to not only justify the program’s existence in light of alternative capabilities, but to also assure them that costs and schedule are under control moving forward. Cancellation is unlikely given that there are no alternatives to the JSF unless enhanced versions of current generation fighters are deemed acceptable, or the USAF can wait until planned unmanned systems mature. But costs and schedules are another thing altogether, particularly with ongoing blowouts and slips to even the most recently ‘re-baselined’ figures. According to a report from Michael Sullivan of the Government Accountability Office (GAO) which was presented to the SASC, the cost of an F-35A in 2002 was projected to be about US$50m (A$55m), but that blew out to US$69m (A$75m) in 2007 and is now at more than US$80m (A$87m) in 2002 dollars, or more than US$112m (A$122m) in today’s dollars based on projected production numbers averaged out over the life of the program. Upon being asked by another committee member on whose fault the cost blowouts are, Carter said “there is responsibility on both the government’s side and the contractor’s side,” adding that previous program head MAJ GEN Heinz had already been removed and the position had been elevated to a three-star level job. Carter also said, “The JSF program has fallen short on performance over the past several years,” and that he expected the USAF to notify Congress of the Nunn-McCurdy break “within days”, but added that he was confident steps taken by Defense Secretary Robert Gates in February and by himself in early March had pre-empted much of the program restructuring that may be required. The program “will require exceptional levels of funding for a sustained period through 2034, competing against other defense and non-defense priorities for the federal discretionary dollar,” he added. Also of concern to the committee was the late delivery of test aircraft to the flight test program. “As of today, three of 12 flight test aircraft operate at one of the government test centres,” Michael Gilmore, director for operational test and evaluation said in written testimony, also testifying that software delivery dates “have recently been extended by more than one year each compared to the plans existing at this time last year.” The test program was supposed to have 10 development aircraft flying by now, with another two due to enter the program in the next few months. Senator Faulkner noted, “The JSF Program Office advises that no significant implications are expected for the JSF Partner countries as a result of the Nunn-McCurdy breach due to the restructuring action which has already been taken in the US. 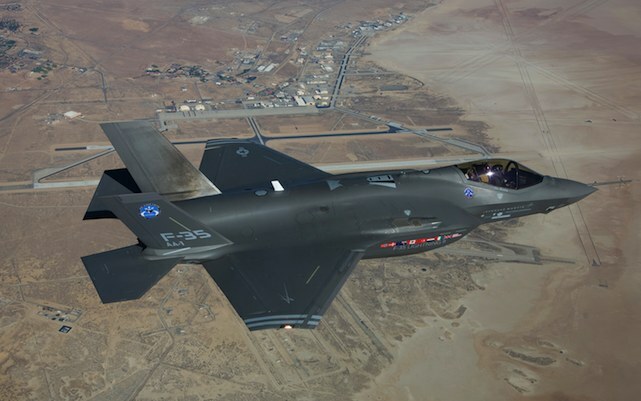 “The adoption of a more conservative budgeting approach by the US Department of Defense for the JSF Program – particularly for early aircraft where cost risk is highest – is a sound management approach for such a large and complex project. So at US$112m a throw, is the JSF twice the aircraft that the US$50m Super Hornet is? I still have no idea why we went into selecting our new generation of fighters blind folded. We didn’t take into consideration any other aircraft when we selected the F/A 18F super hornet for a bridge fighter to replace the F-111s and we’ve done the same with the JSF. If the Australian government wants to finally make the right decision when making a multi-billion dollar decision they should first be well informed and also take more than one or two aircraft into consideration. The right decision is vital, with this selection of aircraft we lose our air superiority in our region to Indonesia with there fleet of SU 27s.and SU 30s. If you look at their air force it may be small but with F16s, SU 30s and SU 27s they become a formidable force. A suggestion that already many have made and the majority back is that of the F22 Raptor. Everyone knows and everyone agrees(even our defence minister) that this is the best of the best when it comes to fighter jets- nothing can match it. So with costs rising well above that of the 2002 original cost of $50m US to a rising $112m why not choose the F22 over the JSF, why not have the best of the best? Why not have a fighter that can do everything the JSF can do better aswell as much more. One last thing we have to remember is that we’re stuck with this fighter we choose until 2030 i think we need something that will keep us safe until then. I’m 15, i want to become a RAAF fighter pilot and this is my opinion. Sorry Toby, the US government won’t sell the F22 to anyone outside of their own military. No matter how much they may need foreign funds to help keep the line open & people employed, it has too much super sensitive equipment & technologies on board. Not even a “partially de-stealthed” version is being considered despite Japan saying it’s the perfect aircraft for them. I am in the process of completing an assignment on the JSF and would like to seek some information on risk analysis regarding the technological failure or impairment – evolutionary acquisition.